Pets are great for the heart but can be tough on your kitchen floors. Being animals, they don’t understand the effect that their claws, drool, and stains can have on various materials. At the same time, if you have a new puppy or kitten in the house then accidents can occur, and with the wrong flooring in your kitchen that could lead to permanent discolorations. Luckily there are a number of popular pet proof choices that can help solve these issues. Ceramic tiles are made from a mostly clay mix that is fired to create a very hard, durable material, that won’t break or crack even under great stress. This is often then coated with a melted glass glaze layer which adds to the strength of the piece, making it virtually impervious to stains, water penetration, and any accidents or scratches that a pet may bring into the kitchen. Like vinyl, ceramics can also be printed to take on a wide variety of colorful or faux natural decorative patterns. The drawback to ceramic tiling in a kitchen is that the floor is very hard. If you are a fan of long marathon cooking sessions, this could be a problem as the surface beneath your feet can affect how your entire body feels, with the pain and fatigue growing greater with every step you take. That hard surface can also be a problem for rambunctious puppies who come running into the kitchen then go sliding across it as their claws can’t find purchase. A vinyl kitchen floor is resistant to just about anything you can throw at it. The largest dogs claws won’t scratch it, the sharpest cats nails won’t pierce it, and if an accident occurs, the vinyl will not stain as long as you clean it up in a timely manner. It’s also generally a great choice for kitchens because it can be printed to match any look or decor, and it can even be installed over a padded underlayment to create a more comfortable cooking environment. Clefted stone refers to materials such as slate, granite, and limestone, where the surface has been left in its unrefined state. This makes for a rough, dimensional look and feel that resembles the face of a mountain. The rustic look of the surface means that pet claw scratches won’t do much damage to it, and as long as it is sealed a stone kitchen floor can be proof against any accidents that puppies may make. While natural stone is a hard tile material it does have some disadvantages for pet owners. First, it is naturally porous, which means that it will need to be sealed regularly in order to prevent stains. Clefted stone kitchen floors can also be difficult to stand or walk on for long periods of time due to both the rigidity and the unevenness of the material. 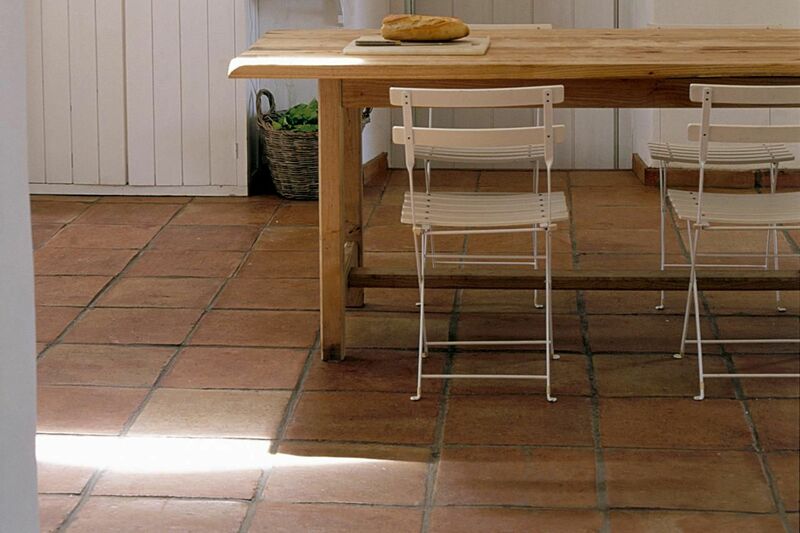 A brick kitchen floor can be a rustic, earthy, warm way to give the kitchen a sense of hearth and home. At the same time, with proper maintenance, it can be proof against all of the problems that pets can cause. It does have to be sealed on a regular basis like natural stone, and it is also quite hard, but it has an inherently cozy feel to it that is comfortable in many kitchen environments. Linoleum used to be a staple of kitchen flooring in the first half of the twentieth century but fell out of favor due to cheap, low-quality imitations that gave the material a bad name. However, its popularity is in a resurgence in kitchens, as the demand for green building materials increases. 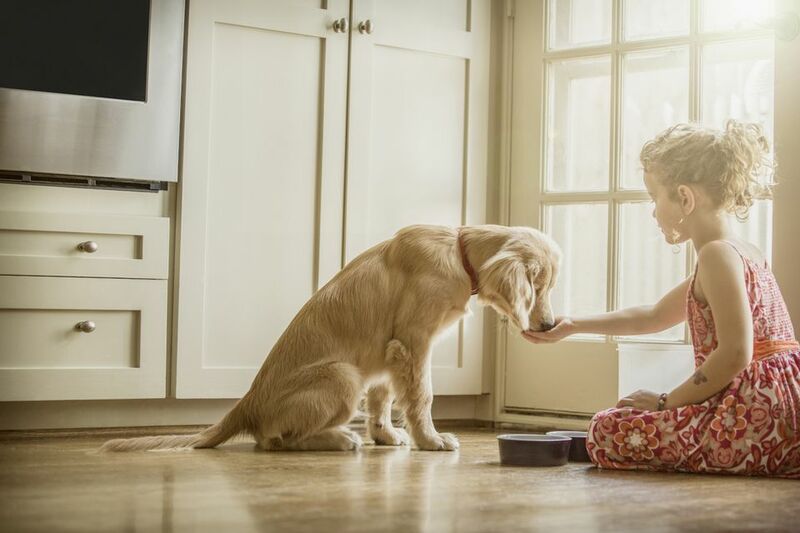 For pet owners, linoleum kitchen flooring offers many of the resistant qualities of vinyl flooring, but without any of the interior or exterior ecological concerns.